Loyalty Card, Artful Soap Co. Loyalty Program Card. Love our products? Find yourself ordering often? 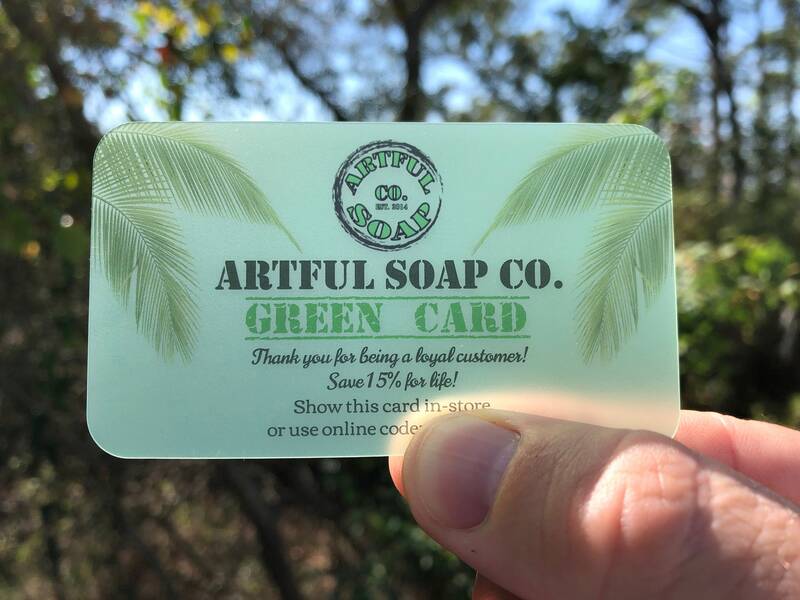 Then check out the Artful Soap Co. Loyalty Card! The purchase of this card will entitle you to save 15% off every purchase, every item, 365 days a year! * No longer will you have to wait for one of our sales. When it is time to reorder, simple use the code on the card (cards are mailed out when purchased) or show the card in-store. We even ship them for free! *This discount is exclusive to card holders only and will not be offered in any other promotion or discount sale. PLUS, any regular sale** we run will stack with your loyalty card discount (Ex: 10% sale + 15% loyalty discount = 25% off)! **A regular sale is a discount on the website and does not apply to discount codes sent out via email. Get yours today and enjoy your VIP savings!